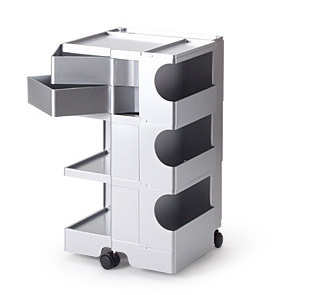 The Boby Cart, or taboret, is an iconic mobile storage unit. 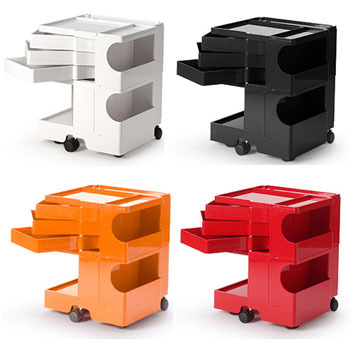 Designed by Joe Colombo in 1969, it was the idealized designer's storage cart. It has that pop-art sensibility, always available in bright primary colors. Functionally they were very usefull, with three pivoting drawers, and a range of shelf and cubby storage on the rest of the base. Special holes on the top surface were there for storing rolls of drawings. I believe they are still made, but old examples are somewhat collectors items as well, with it being in the permanent collection of MOMA. Their modular construction made the shelf and drawer layers interchangable, but this was more to facilitate the offering of different configurations - one, two, or three layers of drawers, as well as two unit high versions.